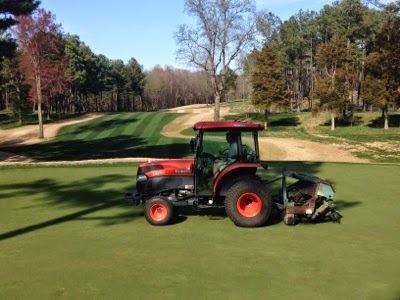 Greens were deep tined with a verti-drain machine to a depth of 12 inches. The wid tine penetrates the soil while providing a a back kick once it enters the soil. This allows the soil to loosen and provide more air space and reduce compaction. 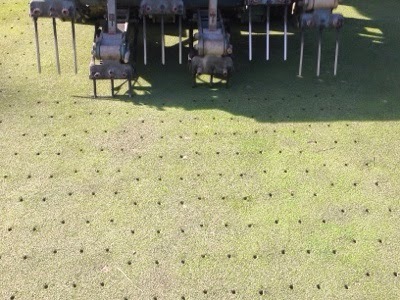 A view of the spacing and size of the tines. These holes provide a great growing environment for the bentgrass roots. 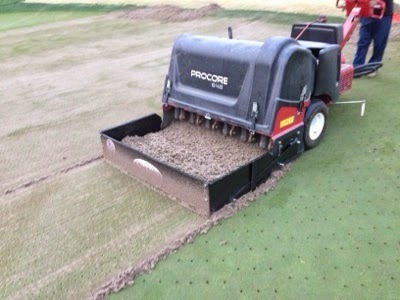 Here is a view of the standard aeration with a core collection box attached to fhe machine. This allows for the material to be collected as soon as they are pull from the ground. Our staff disposes them in the back of carts at the end of each pass. 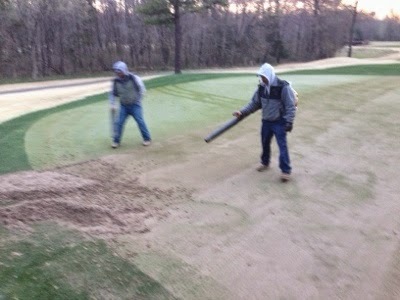 Staff cleaning off the rest of the material to prepare for topdressing with and to fill the holes. Approximately 75 tons of sand will be used during this process. Full recovery will be in a few weeks.